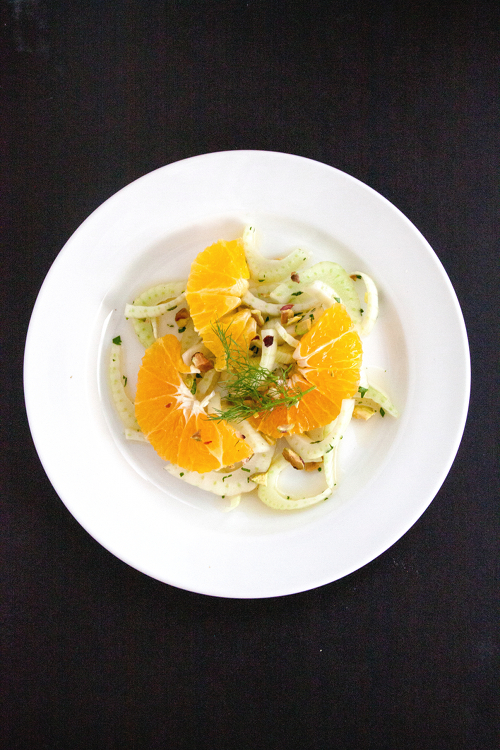 Fennel and citrus salad with honey mint dressing. To me, it's such a great respite from whatever not-so-healthy food I've been consuming lately. Let's face the fact, I have not paid much attention to my diet. I let things slide from time to time, and indulged in greasy, or sweet goodness more than I care to admit. And then there was yesterday. An event where little C graduated from Cub Scout and is moving on to Boy Scout, the Blue and Gold dinner. Where the dinner menu included fried chicken and pulled pork sliders, some pasta and salad. And also the whole array of dessert on the table. I hit my new low. I was no longer holding on for dear life to a healthy wagon, I fell off of it and landed in a fatty puddle. My body just can't cope with it anymore. What the heck was I thinking? The next day I became sluggish. I spent the majority of my day laying down on the coach, soaking in self-loathe. The house was a total mess, but I didn't care. I dragged myself to get up and tried to do my best to (at least) look alive. I was really forcing myself to take a shower and get dressed. But I managed to peered into my refrigerator and found 2 fennel bulbs. I also had 2 oranges. And some mint leaves. It took me 5 minutes to make the salad, and that was what I needed. That. Was. Exactly. What. I. Needed. Maybe I will make more of this and it will be my meals for the next 2 days. 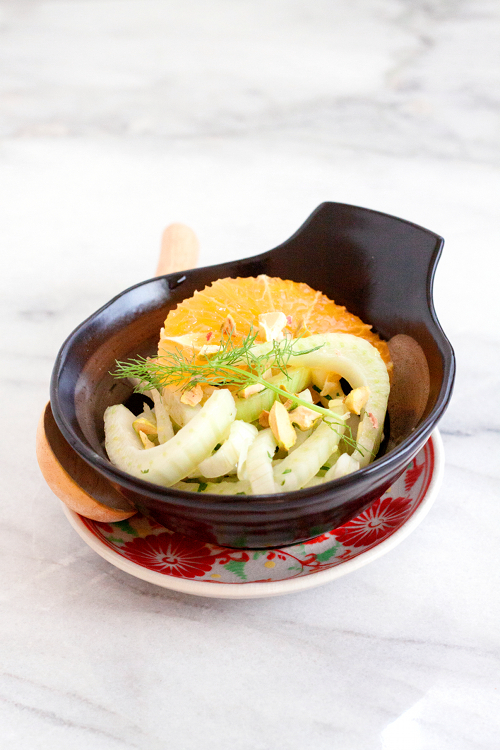 Whisk mint, ginger, honey, and lime in a bowl until well combined. 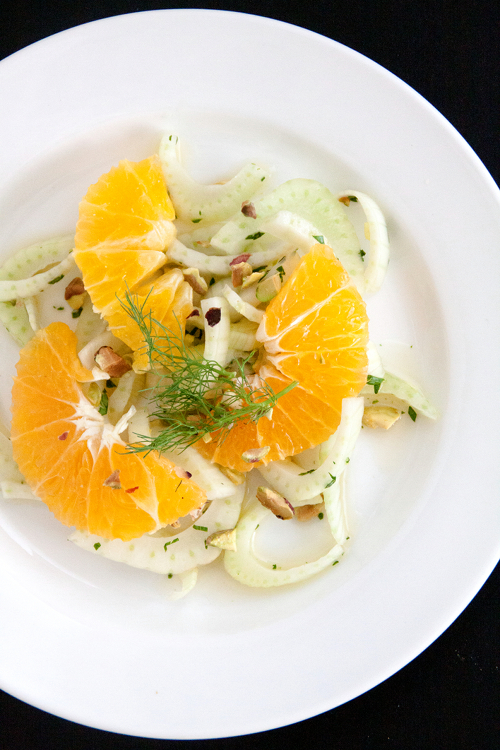 Arrange fennel and orange slices in a salad bowl. Drizzle the dressing over the salad. Toss to coat. Divide salad into individual plates. Sprinkle with chopped pistachio before serving. This kind of salad must be upscale dinning restaurant appetizer in my place! Sorry to hear that. I will be in Jakarta this July. If I can smuggle some fennel bulbs into the country, I'd be more than happy to share some with you.